In a Time Before Meat Decked Your Donut . . . This was written while I was on vacation, which was a few weeks ago, though it seems like an eternity ago. Just getting around to posting now. Monday is J & J’s typical date night so we were able to glom onto their childcare situation and leave all of our children together with their sitter and go out on the town. First we went to La Condesa, a James Beard award nominated restaurant whose owner was, among many other things, Executive Chef of La Esquina in NYC. My dinner was amazing: lamb barbacoa and lamb chop with a mint infused silky smooth sauce. Holy yum. Also, a triple threat margarita with spicy salt. My husband has never been to Texas so the plan for after was to go see Dale Watson at the Continental Club and do some *dancing* but we were too wiped out. Not to wiped out for donuts, though! I mean, who ever is? 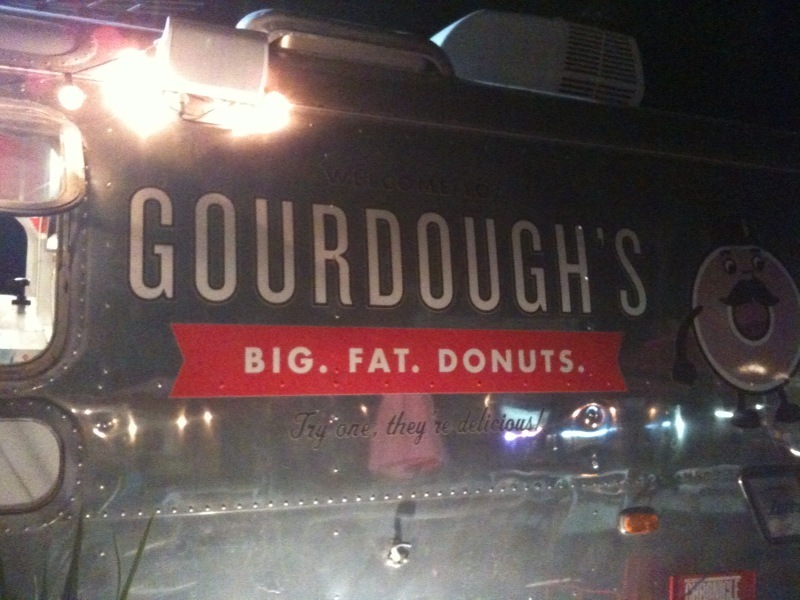 Joseph suggested stopping at Gordough’s, a food trailer hawking, as you can see above, big fat donuts, on the way home. Her belief is that these things are too big to be donuts. Also, being freshly fried, they exude a bunch of heat that can make the toppings—and these donuts are all about the toppings—get somewhat slidey and sloppy. In addition, they are yeast rather than cake. In my community, this can spark a ten-hour long debate, so I will leave it at that. It seemed like there were a lot of reservations about the donut trailer, but they seemed to want to show it to us, anyway. Could this have been because in New York, we have a lot of things, but we do not have donuts with meat on them? We parked and wandered up to some blasting Phil Collins music. First, we decided that we would split a huge donut four ways. It was argued that they were drizzled with pure butter. Then we looked at the menu. There are donuts with chicken on top. There are donuts with bacon. There are blue donuts, ones with peanut butter, habaneros, do you want yours with ice cream . . . Then suddenly, everyone, with the exception of Jen, was getting their own. And Jen would just snack on ours. 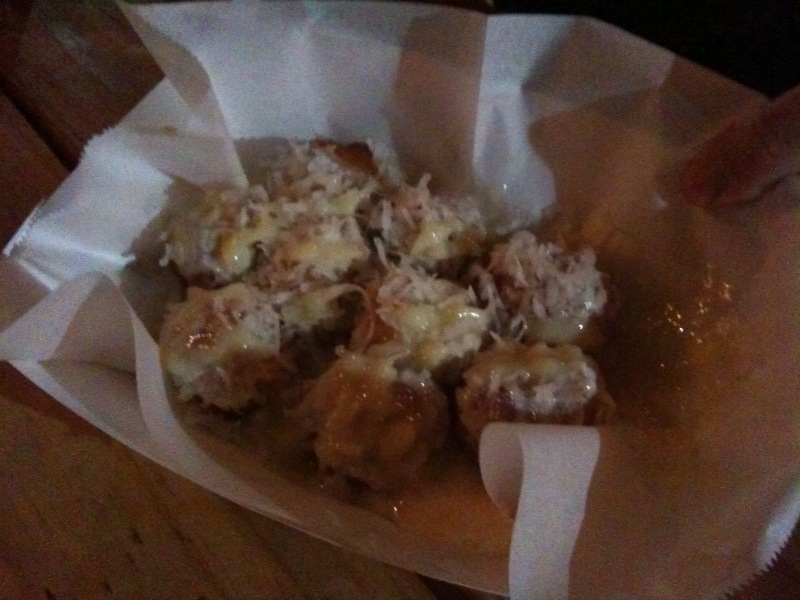 Joseph got a pile of cream-filled donut holes with coconut goo on the top, and fresh coconut shavings. I got a one with cream cheese frosting and chopped up heath bar. Matthew got the sundae model, with fudge sauce, grilled strawberries, and ice cream. Crazy toppings and hub-cap circumference aside, what they reminded me of was the frozen-until-baked donuts of childhood, back in a time before meat might deck your donut. Did you ever have those? They were yeast donuts with sugary glaze. They were a fantastic part of childhood, and these seemed most like those. Maybe it was just the warmth. Maybe cake donuts are good always, and yeast donuts are good if they are still warm. I like donuts. I was cake until I went yeast. But what I really want to say is: Why not put some crispy hot bacon on your hot Krispy Kreme doughnut? Wouldn’t that be HEAVEN? Which donut was your favorite, Meredith? Did you try everyone else’s? Nobody got one with meat? I guess cause it was late night and not breakfast, huh? I have not had one with meat, ostensibly because I became a “vegan” right before I found out about Gourdough’s but also because I am a fool for grilled strawberries.